If you are considering putting carpet tiles in your business, at some point you will need to consider Commercial Carpet Tile Cleaning Services in Birmingham, AL. Be careful who you call to do the cleaning of your carpet tiles. Traditional steam cleaning or hot water extraction should not be used to clean this type of carpet. The hot water and steam method of cleaning puts too much pressure and water into the carpet and can lead to delamination of your carpet tiles. Heaven’s Best Carpet & Upholstery Cleaning uses a low-moisture, encapsulation method of cleaning that is perfect for cleaning commercial Carpet tiles. 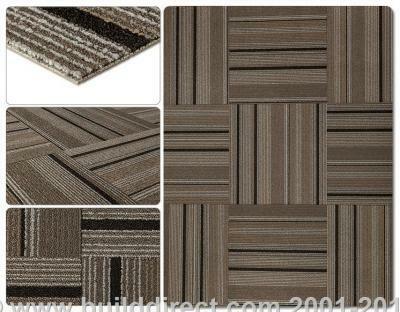 Carpet Tiles can add beauty and durability to your office and they are a great choice. Last year a report by Market Research Reports was released titled “The Global Carpet Tile Market Report.” What the report showed was that Carpet tile is becoming a trend in more and more corporate and institutional facilities. Carpet tiles are replacing hard surfaces as well as regular wall-to-wall carpeting. You may be wondering, what are Carpet tiles? Carpet tiles, also known as carpet squares or modular carpeting, are pieces of carpet that have been cut into squares or rectangles and are designed to be installed directly over a hard-surface floor or subfloor. Carpet tiles are a great flooring option because they are durable, lend themselves to flexible interior designs, and are functional and easy to maintain. With this being said, keep in mind that they should not be cleaned using hot water extraction or steam cleaning. When you get ready to have them cleaned, call Heaven’s Best Carpet Cleaning. We are an IICRC (Institute of Inspection, Cleaning & Restoration Certification) Certified Firm and our technicians are trained on the proper cleaning of this type of flooring. We have great rates and flexible schedules so we can clean at a time that is convenient for you and your staff. Our process is quiet, as well as low-moisture so you will be able to get back to business quickly. Definitely consider putting in Carpet tiles in your office or business, and when you are in need of Commercial Carpet Tile Cleaning Services in Birmingham, AL, call Heaven’s Best Carpet Cleaning at (205) 618-9150 for a FREE ESTIMATE.